"Then is the power that once man had." Every time Gordon Whittier squinted at the arched stone footbridge, he visualized the Sheriff of Nottingham and his troop of horsemen galloping across, but this time the players seemed for all the world like a snarling swarm of kids carrying sailboats. Common sense said they couldn't be, of course, not unless they were all hopelessly dense! The morning sun had barely cleared the horizon when Fenway locusts buzzingly declared another sweltering Boston day. The stagnant air dripped like wet, sour cotton. Not a breath stirring, yet here were kids bent on sailing boats? The swaggering quartet with the blue-and-gold radio-controlled sloop should have known better, as they came often to the pond. The others were younger, one roughly eight and curly-haired, his scared-looking friend no more than five or six, with jet-black hair and deep set eyes. He clutched a homemade, much smaller boat while his companion hurled insults back at the four. Whittier, chuckling, closed his paperback over a finger. Kids! The crude boat was totally outclassed, but no matter, not today, not unless they were all to stand in the water and blow on the sails. The pond's glassy surface rippled only where darting dragonflies practiced touch and go; listless leaves dangled from bored branches; clouds were riveted in place against a hazy, canvas sky. Still, the boats were placed in position; still the rowdy teams huddled, and taunts flew like shuttlecocks in a badminton game. The black-haired boy took something from his neck and draped it over the broomstick mast. Satisfied, he turned with proud determination to his contentious friend, who promptly flipped their older antagonists the bird. Shaking his head, Whittier dug into his cooler for a root beer--and completely missed the start! A doctoral candidate in psychology, he knew his chosen field was an imperfect science rife with speculations, changeable truths, abstract theories and hogwash. He'd jousted long and often with his Harvard professors, all of whom defended themselves with shields of theoretical baloney, and made the required concessions to get his grades. But he'd vowed that, once out, he'd reject semi-truths and fantasies. He'd defend his work with solid, logical truth as he saw it and he'd never wavered in his belief that he would keep that vow. Yet, on this steamy dog day in a park in Boston, his pledge was put to its first serious test, not by droning professors but by a crude toy boat. Heeled over and cutting through the mirror surface, it shot forward while its immensely more able opponent slowly spun around its centerline, the cursing owner thrashing his radio-controlled rudder back and forth with angry yankings of the transmitter's joystick. Whittier sat bolt upright. Locusts still proclaimed the day to be as it really was; dozing leaves drooped like limp Dali watches; iridescent dragonflies hovered effortlessly in the torpid air; dust kicked up by the kids settled back slowly and directly to its origins. Not a hint, not one iota of wind anywhere, yet the smaller boat had already reached the opposite shore with sail full, heeled over smartly. Driven by a good breeze? Totally impossible. No! Whittier shot to his feet, his book tumbling into the dust. The quartet of furious losers beat the crude boat's happy owner to his property, jerking it from the water and reducing it to kindling in seconds. Then they turned on the winners, who ran for their lives, three of the four close on their heels. The last of them made a respectable run of it even with the losing boat bobbling in his arms. Whittier pulled on his loafers, but not quickly enough. "Hey!" he roared, bolting after them, but they were over the bridge and streaking down the dusty pathways. He stopped, wide-eyed, incapable of accepting what he'd seen. Yet there, at the pond's edge, a heap of splintered wood and torn cloth gave mute testimony to the fantasy race. He stood for long moments gazing at it, brain reeling over the implications. This was no imagined scene, no Robin Hood movie set. He--skeptic, champion of truth--had just witnessed creation of wind, so controlled it affected only the chosen boat even at the close quarters of the start. He'd felt no air moving, not so much as a zephyr, and yet without any explanation.... The hair on his arms stood straight up--goosebumps. Absurd! There were explanations for everything. Fantasies were simply unacceptable. The quartet of losers couldn't be part of the riddle. That left only the younger boys, didn't it, since there wasn't another person in sight anywhere? He rubbed his eyes and looked again at the pond, afraid of seeing what he knew he'd see: not a ripple. Not one thing out of place, nothing unusual. And yet there had been... something... some control of nature he knew to be impossible. Wind from nowhere had propelled the winning boat; wind from nowhere, delivered with precision. Incredible! Whittier, you imbecile, how can you be thinking such drivel? You're hallucinating from the heat. There was nothing of the kind. No, I saw what I saw. He emerged from his ramblings with a start. Standing over a pile of rubble for... how long? Minutes? Thankfully no one had seen him there, almost at attention, a squinty-eyed ninny straddling a pile of sticks and cloth like Gulliver in Lilliput. He shook his head and, almost an afterthought, stroked a toe through the rubble. The act uncovered a piece of dirty string--no, rawhide--attached to an object the size of a walnut. It was a stone, purple in the hazy sunlight, but with dark red showing at the bottom of several deep, deliberate cuts, as if the center were a ruby. The rawhide was smooth, round, worn with age. The thing had been around the black-haired boy's neck. He'd hung it over the rustic mast before the lopsided race began. Could it have?... Ridiculous! It was just a stone, probably an imagined charm of some sort, an amulet. He retraced his steps, pausing again to stare at the fragments and the polished water comforting them. He'd keep the charm, if that's what it was. The boy might return for it. Thoroughly rattled, he dropped it into his cooler and dusted off his paperback. With occasional glances at the rubble, he tried to focus on the book, only to replay the one-sided race in his mind over and over. I saw what I saw. But it was difficult concentrating with the air so deathly hot and still, so oppressive, so... smothering. The dragonflies were bolder than ever. And the locusts sang much louder than before. GRU Headquarters, Moscow. February, 1972. The irregular rectangle of dingy, nearly windowless concrete alternately appeared and faded, a monstrous, ghostly specter looming behind swirls of wind-whipped snow driving from the east, from the Urals; horizontal, sleet-laced, eye-stinging snow whistling through the sprawl of old aviation firms and airport structures that were once Moscow's old Khodinka airport. First Scientist Nina Rubinova shrugged farther down into the heavy fur collar of her greatcoat, bracing for the final approach to the shadowy building, a distance of two hundred meters she was obligated to cover on foot. All visitors walked to the first security checkpoint regardless of rank or station, escorted by armed sentries; other guards took over inside. Dogs were everywhere--barking, running back and forth inside wire fences, patrolling with armed handlers; dogs capable of tearing a defenseless person to shreds; dogs that this day wore thick, snow-crusted jackets and padded helmets as protection against the elements. At the initial checkpoint Nina surrendered her purse and watch, plus a ball point pen and her belt with its metal tongue. Nothing metal could be taken into the building. She'd been anticipated at every checkpoint, thanks to her cousin's elevated rank, yet tens of minutes were spent repeating answers to identical questions asked minutes earlier. An hour after entering the building she was led into the assigned meeting room, barely a hundred meters from her starting point, where her guard recited a memorized script about the room's security features. He directed her to sit at the table inside, and the door was closed--locked, she assumed from the sound. She stood anyway, bristling at the guard's arrogance. His ears were too small for his pink, little boy face! The room was a gray concrete cube on a gray concrete floor in a gray concrete building. Even the ductwork for ventilation and heat was drab concrete. Walls, floor and ceiling were smooth everywhere--all corners rounded--and lighting came from fifteen feet above the floor. No phone lines or wires entered the room, and steel reinforcements buried inside the concrete had been electrically bonded to steel elements of the building itself, so said her guard. The room was as isolated as if on the moon. There was no window, not even a peephole in the door. The only furnishings were steel, a table and four heavy chairs without cushions. Her back was to the door when it abruptly opened and two men entered. Leading was First Deputy Chief Colonel-General Boris Vasilyvich Kalanin, whom she recognized only from a few photographs shown her by her aunt, his mother. He immediately introduced himself, then presented Viktor Lyunov, without reference to rank, as the man running the GRU's Operational/Technical Directorate--the person she most needed to impress. She was satisfied. She'd expected no less a response to the gift she'd brought. She immediately chose a chair and sat, Kalanin on her left, Lyunov opposite him. Lyunov was a thin man, tall, with dark hollows in his cheeks and a wild shock of graying hair above cold, brittle eyes. He wore neither uniform nor insignia. Other than a weak nod of stolid acknowledgement, he'd said nothing. By contrast, her once-skinny, insolent third cousin Boris had matured to become a stocky bull-of-a-man with bushy, dark reddish hair and a dominant forehead that gave him an evil profile. A man who was but one step from the top of the world's largest intelligence organization, his manner could have been threatening... but it wasn't. He, too, wore civilian clothes and was open-collared. In a certain way he still had the boyish look she remembered from the single time they'd met so long ago, but he was now a powerful man in a powerful organization that was itself the brains of a powerful army, in spite of his manner. "Dr. Lyunov is interested in your recent work," he opened. Lyunov nodded without expression. "He knows your background, Dr. Rubinova, so let's move directly to your reasons for requesting this interview. This is a totally secure room and nothing is being recorded, but your past work for our KGB comrades at Novosibirsk is undoubtedly considered secret in their eyes. You alone can judge the consequences of what you say here, or anywhere else for that matter, but we are not them." "The honorific is not necessary," she replied. "Nina will do. As for secrecy there is no way I can establish my own credibility here without violation, as you say, so I will go ahead and violate." She turned to address Lyunov, brushing back a wisp of pepper-and-salt hair. "Until recently my work has been in 'disruption', a psychological warfare term covering anything that can turn an enemy's concentration into disorientation and confusion. You may recall the loss nine years ago, with all hands, of an American atomic submarine during sea trials, the Thresher. That was--"
"I am well aware of the Thresher," Lyunov interrupted, his voice strained, almost a whisper. "The Americans judged it an accident, the cause a quality problem during overhaul, something to do with brazing as I recall." "They listed that among the most probable causes, but the hull is still down there in six pieces. A tribute to our skills in that their conclusion was exactly what we'd planned, although not all of the Americans agreed with the official findings. For example, there was never an explanation of why all the messages throughout the crisis were so garbled no one on the surface understood more than pieces of them. There were even sounds amounting to laughter during the crisis, this from a boat just three hundred meters deep at the time. Why did it have trouble communicating with surface craft immediately above it? A brazing problem deep in a reactor cooling system does not affect communications." She dangled the question as if Lyunov should have asked it himself. "Are you aware that certain of the American admirals and their technical experts challenged those findings and suggested that the garbled messages were related to a sort of mental mass disorientation among the crew, what amounted to unbelievable nonchalance in the face of crisis? They stated for the record that any kind of confusion on an atomic submarine, American or Russian, could lead to a long list of disastrous accidents unrelated to equipment failures; that nonchalance in the face of crisis was the equivalent of being drugged. No one else mentioned Russian submarines, or used words like 'drugged' to explain why the boat was not headed back toward shallow water before they shut down his reactor. Suggestions that some force outside the submarine had caused mass confusion among the crew were ridiculed, as we knew they would be." "Nina, what has this to do with our meeting?" rumbled Kalanin, his face clouding. "Is this why you are here? Are you saying you were in some farfetched way connected with that accident?" "Confusion on the Thresher was my work, yes. Twenty of our best telepaths were programmed using methods I developed, and their efforts fused together... harmonized... using techniques I alone perfected." "I was assured telepathy was not your field," objected Lyunov, glaring at Kalanin. "We are not interested in telepathy." "My field is psychology. My challenge was to harmonize twenty telepathic individuals so their combined mental energies resonated like an orchestra reading from one score instead of twenty. I am telling you this for background, since the KGB would never identify me, or my work, or find any reason to discuss their scientific programs with the GRU. How else could you have known what I just told you? As to why I am here, Kogan assigned me a different kind of project, one I have been working on the past year or so." She took a breath. Everyone knew who Kogan was. Now Lyunov would listen. "I have discovered a definite connection between forms of psychic energy, produced abnormally in the human brain, and changes in matter. The general phenomenon was known as early as 1947; nothing prior to that matters. I call my version of this phenomenon psycho-physio-kinetics... PPK for short. The KGB knows almost nothing of this because I have told them as little as possible. Even Kogan knows nothing. As a result, naturally, my project was among the first to be discarded as worthless, but I knew from the start it would be canceled anyway. My purpose was to protect my findings. "I'm certain now that PPK is linked to hormonal interactions in the limbic portion of the brain as well as the diencephalon, where the pituitary is found. The limbic helps modulate joy and hate, love and sorrow, emotion and memory as I presume you know." Lyunov nodded slightly again, looking almost sleepy, but he was listening intently, eyes narrowed. Kalanin slouched with his fingers interlocked across his considerable girth. "Hormonal activity in the limbic is held in equilibrium through functions of brain chemistry. The western term is 'stereoisomerism', or mirror imaging," she said. "If I raise my hand, my reflection raises its hand the same amount, and so on. No one truly understands why some individuals generate more PPK energy than others, but in my opinion their equilibrium is quite unbalanced... the image does something different... and I'm close to discovering why." Lyunov raised one eyebrow. "Changes in matter?" "Temperature, molecular arrangement, color, texture...." She waited for a nod that didn't come. He was looking through her, eyes unfocused, mouth pinched. Finally he held up a bony finger. "Molecular arrangement. Talk about that." "Good!" It's where I was heading in the first place. "There is already one person, not Russian, who has demonstrated this kind of PPK, many times more powerful than any I have seen. He's been idly tested by others, but he's not under any controls I would call scientific." "The Israeli, Uri Geller." She raised her palm as Lyunov started to object. "Yes, I know, I know. His performances are called parlor tricks by some who'd suffer professionally if they said anything else. However, I have items Geller altered in full view of hundreds... rings, spoons and keys... that bent or broke without external force and not always at the point of least metal. I have examined them carefully. The original metal seems to have become a porous matrix as if part had been vaporized. I have discovered no chemicals or energy forms known today that could have produced such a change. We have tried everything we know to reproduce the effects, but without success. Here is a perfect example of changing the molecular structure of matter. Geller has also broken chains by making complete links fall apart without touching or seeing them or even being in the same room. The thrust of my research has been to duplicate or exceed his powers in a normal person. There are many questions, naturally, but I am extremely close." Lyunov stopped her. "This Geller craves publicity and applause according to all the reports I have seen, in spite of what you say. He credits his powers to visitors from outer space at the age of four. If ever there was a certifiable fake, he's it!" "I say he is genuine. The Americans, British and the Israelis themselves are fools when it comes to PSI. If they'd studied Geller and others scientifically, as I have, they'd know better. Americans refuse to spend taxpayer dollars on PSI research. The British have nothing to spend in the first place. Both ridicule the man through their media. The Israelis like him because he fought in their 6-day war and makes many appearances there, but they treat him as a performer, too. Either way, he is living proof that humans are capable of PPK power, a phenomenon that demands explanation. We need to learn how his brain does this, then increase it, direct it. I don't care how he came by his powers, but I know that, once understood, they can be taught to normal people. "Now... Geller seems normal, except for what I just said, whereas others are not. They're usually idiots, or 'idiot savants' if they have anything else special about them. In these cases, one aspect of their brain is subnormal, making them what they are, but the opposing aspect is supernormal. Using the mirror again, I lower my hand and the image hand rises, but not necessarily by the same amount. There's a link. To study it and get anywhere I must now use healthy, normal human subjects. Risks must be taken." Lyunov leaned forward as if her very words were to reveal the answer to space travel. "And have you been able to control any of the experiments you've been running?" "I am a First Scientist!" she snorted. "Of course I control my experiments!" "All right then... give me an example." He sat back. "An example," she repeated. "I will use for your example a boy we call Ivan, one of my better subjects. Ivan is a twelve-year-old idiot who can't even dress himself, and speaks no more than thirty recognizable words. In spite of this he has a talent for generating instantaneous heat in glass, enough to fracture certain forms. I use marbles. He is able to fracture every red marble among various colors, but only red. One hundred percent of the reds, nothing else, not even pale red. Red as in a primary color. I am sure you can think immediately of ways in which this simple talent can become a powerful tool if only we can control it and direct it." "That is our usual material, yes. He likes marbles and they're cheap, so we use them. My point is--"
His index finger pointed at an imaginary spot above his head. "Silicon... with impurities." "Impurities? Of course, yes. Now, if--"
"Well, that's the question, isn't it? The simplest theory is that Ivan resonates with red so his power is somehow directed to it. I'm trying other things made from silicon, but always red items are the ones he breaks. I can't use objects that don't interest him so I first find things he likes, then make some of them red." "In the items that are fractured, always silicon, yes. So far, yes." "Could he fracture green if he liked that color?" Lyunov was suddenly animated; his interest changed his whole appearance; the hollows in his cheeks were gone. He seemed taller. "Probably. But here is the peculiar part: he doesn't look at the marbles when he exhibits this talent. Sometimes he never sees them, just as Geller doesn't see items he changes. I have hidden red marbles in bags, boxes, mixed together with other colors or alone. When we play the game, always the red ones are broken no matter where I put them. His power is therefore non-subjective, do you agree?" "Yes. It's the power that's selective, not the subject. The power seeks red marbles because he thinks of them, because he sees red marbles in his mind and not because they're different in any physical way from the others. As you say, he resonates with red." "And yet he plays a part in the selective process because his liking for red is subjective to start with. PPK power is directed according to whatever he is picturing at the time, and in his simple mind red is the dominant element. You have just described the key to PPK. Change the picture in the mind and you will direct the power there." "At what range, Nina? How many millimeters away were the marbles?" "Millimeters? Ivan is up to two kilometers so far." Lyunov, now on the edge of his chair, glanced quickly at Kalanin, who sat listening, fully composed, fingers still interlocked. "His power... is it large or small compared to Geller's?" "Much smaller, though he improves with practice. We needed a way to measure this energy so my husband, who is a physicist, invented a device to do just that. It contains a unique white emulsion plate that records PPK energy. Ivan began with eight units of PPK and is now at twelve, enough to fracture as many red marbles as I care to use. There seems to be no limit to the number. He thinks it is a game." "Then it must be some sort of force field, not separate rays of energy." Lyunov turned briefly to Kalanin. "A field is not weakened by the number of objects in it." Turning back to Nina, he spoke more quickly. "Your instrument... how does it work? What do you call it?" "Just bely yatchik... white box. After each experiment the emulsion plate is removed and examined under a microscope. One sees tiny specks of black, like pepper, on film that begins as pure white. The distribution is uniform, so a count of specks for one square centimeter of surface is enough. A reading of twelve specks is 'twelve', and so on. All the numbers are relative. In the absence of any real PPK power the plate takes several days to show any changes from background levels, but it is always prepared fresh for each reading, fresh meaning totally white." Lyunov again locked eyes with Kalanin, speaking obliquely to her. "Did any of your experiments cause failure of equipment nearby? Electronic instruments, for example?" "You are very quick. Yes, but I have drawn no scientific conclusions and I am not quite ready to generalize," she said carefully. He was heading directly for the prize. "Failures that you perhaps chose to overlook because they would suggest lack of control to your KGB overseers? Remember, I am no stranger to such things." "There were a few failures, yes, but my overseers... as you call them... were not the issue. I was already withholding that kind of information from all my reports, and I believe you may already have guessed why." She waited. It was Kalanin who took the cue. He rose and went to the door, opened it and beckoned to the guard outside. "I must ask you to wait outside for a few minutes, Nina. It will not be long." "Well, Viktor, what do you think?" "How well do you know her?" "A distant cousin, no more," shrugged Kalanin. "I last saw her when she was a snot-nosed kid, nine or ten... something like that. KGB are closing down all of Novosibirsk--"
"Yes, and moving it all to Moscow," interrupted Lyunov. "They're being utterly stupid, as usual, but they will take her back if they think she's important. They are such imbeciles!" He gestured with both fists. "Which we already know, but is she important or is she simply looking to get out of her predicament? She is inflated with her supposed brilliance because of this... this Kogan. Of what use is her research to us?" "Boris Vasilyvich, are you serious? What she is describing with the marbles is absolutely incredible, a weapon more powerful than anything we've ever imagined in terms of what it can do. And the cost is nothing! Not billions of rubles, not millions, nothing!" "Using an idiot boy? Rubbish!" "Yes, okay, so an idiot boy today. And tomorrow? Five years from now? Ten? Boris, listen to me! If just one normal person can be taught the power of that idiot boy, anything made of silicon can be destroyed if it's in range. The power causes an instantaneous flash of heat inside whatever it is, which then shatters like an ice cube dropped in boiling water. The tiniest speck of intense heat will do it. She said two kilometers! Over a mile in the American system with someone who can't even tie his shoes. Forget the stupid red marbles. Well?" Kalanin stared at him, waiting. "Don't you see? Transistors are made of silicon! Extremely tiny, delicate slices of silicon! Slices no thicker than a butterfly wing. It would take no heat at all to shatter them, none!" "Ah, you are thinking of computers then--"
"Yes, yes, computers and instruments and tools and weapon systems and technology and everything else, all of the West... and China... and India... and Iran... all of them! It's the basic building block. They are all building arsenals against us, especially the Americans, and every day the arsenals are higher in technology, using more and more silicon devices. We try to catch up of course, but they are way ahead, which you of all people know. And since computers are not made here in Russia we are behind before we even start. I tell you, their whole society would pop like a flashbulb if something like PPK took away transistors! My friend, we could stop them; we could pull the plug on their technical society. Some day soon we may have to do just that... to survive! Look, we have this idiot boy who causes equipment failures she then conceals from our beloved KGB comrades and why does she conceal them? Because she immediately sees the implications. The failures are proof of what I am saying." "Not all of the boy's power goes to those red marbles, don't you see? Some affects other things that are silicon and the most delicate shatter first. With those things the slightest crack, the slightest flaw, the tiniest break and you have junk. One bad transistor out of thousands is enough to bring down a full system, and if there are many? I'll bet you a month's pay that in every case those failures were traceable to transistors, nothing else. Oh, I guarantee you she knows what she has discovered and has been clever enough, early enough, to hide what she knows. What a weapon this could become!" He sucked breath through his clenched teeth. "You are too easily convinced. She said the boy had to see the objects in his mind. Do you think an idiot boy sees transistors?" "That was just her theory, not proof. Those failures are the proof. She is still learning about this thing and now she wants to use normal people. She wants to find how to duplicate Ivan in a normal person and control the results. It is possible!" He slapped his hands together. "I say we give her what she needs to make it possible, but it will be imperative that we isolate her from KGB snoops, keep her work so secret that even she won't know what she is doing. We are looking at a power far greater than anything atomic. If she succeeds with this thing, we will have the ultimate weapon, and you know what makes a weapon ultimate, don't you, my non-technical friend? Well?" Kalanin's mouth twisted as he considered Lyunov's words. The man was off on a galloping tangent. Rubinova had revealed nothing beyond a few abnormalities in an idiot boy. Besides, the GRU was not in the business of making ultimate weapons. "Why don't you just tell me, Dr. Lyunov." "One that disables all other weapons, of course. And if the other weapons are all built with modern electronics? Silicon electronics? Yes?" Kalanin stared. Suddenly he raised both arms and dropped them abruptly. "All conjecture. Well that is your area, comrade, not mine. Keeping her work secret should be no problem. KGB will watch her, obviously, but they will think she has gotten special favors because of my position and our distant family connection, not because of her work. I will try to convince them otherwise, of course, and because of that they will assume they are right. We must, I suppose, place her where her work won't accidentally destroy all our computers, ha ha...." His almost-smile turned sober. "But where is there any assurance she will succeed as you say? She doesn't know the power can be improved above this Ivan idiot, and he is her best subject, no? KGB thought her work was useless." "She wanted them to believe that. She knows what kind of weapon PPK can become and she had the good sense to come here with it. Frankly, I believe she will succeed." Lyunov's steely eyes glittered. "I feel it!" "Well, it falls into your camp, comrade. I'm not saying you are wrong, but a few scattered failures don't equal a weapon. I need more than that. A weapon such as the one you describe would certainly change the game, though, would it not? It's worth a try." When she was once again seated, Kalanin took charge. "Nina, how confident are you that you can perfect this PPK? I'm not interested in your scientific judgments, only what you believe based on what you perhaps have not told us or can't tell us." "How do I answer that? I am a scientist, and nothing is ever assured in research. There are risks." "Use a scale from one to ten... ten being the answer you know Dr. Lyunov and I might want to hear," shrugged Kalanin. "Nine, then! That is higher than my personal expectations for anything else I have ever done. I don't know how long it will take, only that the answers are within reach. Again, we must take risks, human risks." "What about your competition? You say the Americans are doing nothing?" queried Lyunov. "Is anyone else? The British, maybe? Germans? Swedes?" "I have uncovered no one remotely curious about PPK except for a single obscure American, a psychologist who has neither funding nor the interest of his government. Other than a few letters he's sent to medical journals, he's unpublished, an idealist interested only in the medical aspects of people like Geller. The giants on the American scene are avoiding PPK totally, so there is no one, certainly no one who recognizes the... shall we say... military importance of my discoveries?" Her sudden smile was matched by two others. Kalanin tapped his extended fingers together. "Precisely, Nina. One mission of the GRU is to ferret out and identify threats from the outside world and render them harmless if we can. We are correct, are we not, in concluding that PPK directed against such threats could help us meet that mission? And that it's this possibility that brought you to us?" "That is exactly why I am here." "Did you happen to analyze--" Lyunov began. "The instrument failures?" she finished. "I did, and yes... they were all traceable to failures of silicon transistors and semiconductors. Was that your question?" Lyunov smiled across the table at Kalanin. "What did I tell you?" "Your husband is cleared to your level?" Kalanin inspected a fingernail. "We are both cleared for any scientific pursuit." "Which the KGB will now retract. I presume you are both willing to join the Army of the Union of Soviet Socialist Republics?" "I am; Valery as well. He is an excellent physicist and he understands much of my work. Will we still work together?" "It can be arranged, yes, but your work must be kept secret even within the GRU, Nina. We must be extremely careful to--"
"Who is the American?" interrupted Lyunov. "What? I don't understand your question." Nina thought for a moment. "Whittier. Yes, that's it... Whittier. He's a nobody." Conference on Adaptive Systems, Chicago. July 6-10. 7:30 to 9:00. Breakfast in the main conference hall. Whittier's reading of his work took place while breakfast dishes were cleared from the room's eighty tables. Delegates chatted and smoked, schmoozed or just wandered around as he spoke; silverware and glasses clanked; red-coated busboys pushed carts and replaced soiled tablecloths. The honor of giving a paper wasn't reflected in audience attention, Whittier realized, but the fact held little consolation. His presentation vaguely paralleled Goldstein's work at the Addiction Research Foundation. Goldstein, a professor of pharmacology at Stanford University, studied the workings of opiate drugs in brain cells. Whittier sought the elusive links between talents of 'idiot savants' and their mental disabilities. If the same analogy were applied to a normal person, then the raising of one chemical side without the other side falling resulted in super powers of the brain without any deficiencies at all. Fitting into this category could be the likes of Uri Geller or Mathew Manning and others who could demonstrate extremely unusual talents commonly called 'mind over matter'. The challenge for modern research: raising one end of a chemical balance (which end?) without lowering the other, a feat possibly involving hypnosis as well as drugs. The answers held possible cures for mental illnesses as well as the keys to mental abilities long dormant in humans, powers mankind once may have had. Research was most certainly indicated, and with it money for support. There were no questions at the conclusion, the ultimate insult. Whittier left the podium with his face a mask, making his way toward his now-empty table. "Dr. Whittier...." A slightly built man came toward him, hand extended. Heavy tortoiseshell glasses perched above a smile as broad as the man's face. "Gene Pelletier, from Stanford Research." "Your theory, sir... most intriguing. Most intriguing!" "Thank you, Dr. Pelletier." Pelletier beamed, but said nothing. "Stanford? You must know Feldman there, or Puharich?" "Dr. Puharich, yes. He worked with that Uri Geller fellow awhile back. Geller's a kind of superman, right?" "No doubt there's something different about Geller's mental chemistry, yes. There are others like him--"
"Dr. Puharich is a great fan of Geller's," interrupted Pelletier. "I really should contact him, but I've been too busy looking for funding and planning a facility. It's a one man show when there's no money, but I'm hoping to stimulate someone in the government--"
"Most intriguing!" interrupted Pelletier again, as though he'd said all he wished to say. He shook Whittier's hand and moved past him, suddenly hurrying from the hall. Whittier swallowed, feeling empty. He'd hoped for something important from the conference, some lively dialogue or a clue to government funding. But there was no interest at all, other than a rather odd fellow with a conversation block. In his hotel room Pelletier opened a small pocket journal to a fresh page, dating it. His mood was upbeat. list. Sending conference proceedings to my control. GRU source agents everywhere had Lyunov's newly circulated list. A full report was mandatory if just one of the dozens of entries were overheard or read. Whittier's paper seemed to have used the complete list as a lexicon! Gene added a note on the disinterest of other conferees. No one had asked questions; no one else had even spoken to the man. What luck! He'd write to Whittier, build a friendship. Moscow might want Whittier monitored and who better than an agent who was the man's friend? This would be his first truly valuable report. A few more like it and the big money would flow, just as his control had promised. God, how he needed it! Jessica was a demanding woman and he'd foolishly boasted to her that he ran a whole department at SRI. Department heads made big bucks. No Place for Gods Copyright © 2004. Gerald W. Mills. All rights reserved by the author. Please do not copy without permission. Formerly titled "Then is the Power." Author's preferred edition. "If you like fast-paced plots built around man's untapped powers, you will love Gerald Mills's superbly-crafted novel of international confrontation, where atomic arsenals count for nothing in a power struggle of a different kind. "All power is neutral. Its wielders promote good or evil with it. Then Is The Power pits human failings against triumphs, cold logic against great leaps of faith, and confirms what we already know: mankind is not ready to inherit the greatest powers of all--those mankind may once have had. Then is the Power could be a great movie!" Reviewed by Uri Geller, internationally known author and psychic (2001). "Chilling possibilities, heart-pounding suspense, and non-stop action! "Gerald W. Mills' "Then is the Power" delivers from first page to last. In a blink the glittering lights of Las Vegas are dark. The city is burning, planes crash to the earth, cars won’t run, all communications are out. "President Winfield and his staff have barely formed committees to investigate the tragedy that has cost over 1000 lives when he learns the cause. The Russian Ambassador comes to see him with a chilling tale of the discovery of PPK, PSI mind powers and an ultimatum. He has 24 days to annex the US under Russian control or 30 hidden agents will use these mental powers to reek devastation across the country. "Millions of lives and the future of the nation, now depend on the unrecognized research of an obscure psychologist. Dr. Gordon Whittier must locate a boy he saw control the wind to win sailboat race more than thirty years ago. He must find him and teach him to harness that power or all is lost. "THEN IS THE POWER doesn't miss a beat through the intricate and varied plot twists and stories weaved together into a thriller that will delight Koontz and King fans. Gerald W. Mills has created an amazing cast of characters that combine all the good, the bad, and the ugly that make up humanity. They leap with life with gripping reality from page to page of bone-chilling thrills, moral and ethical dilemma, action packed suspense, and romance, in a battle of guns, wits, wills, and supernatural mind powers. THEN IS THE POWER is one of those pick-it-up-can't-put-it-down page-turners." Reviewed by Charlene Austin © September 2004 for Writers and Readers Network. 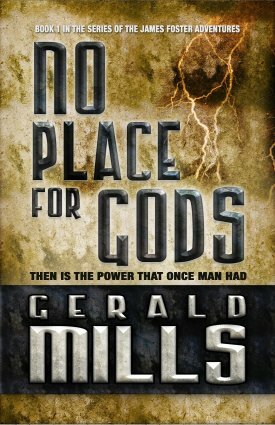 "THEN IS THE POWER, by Gerry Mills, is one of the best books I've read in a long time. Against a background of international intrigue and political infighting among members of a president's scientific advisory committee, Dr. Gordon Whittier, a little- known psychologist, and a team of psychics race to save the United States from a threat such as the world has never imagined. "...This excellent novel is so suspenseful that the reader won't be able to put it down once he or she opens its cover and becomes immersed in its thrilling world. Mills has done an outstanding job in every respect. The plot is a roller coaster! The characters are fully developed, believable, and interesting, and there is a well-considered back story to the plot as a whole and to the individual situations and characters involved in the story's non-stop, heart-pounding action. By all means, buy a copy of this great novel. It is well worth the price." Reviewed by Gary Pullman for Scribes World reviews. "Gordon Whittier, a doctoral candidate in psychology, witnesses a children’s toy sailboat race and sees what can only be described as an amazing display of mental power and control. This display of telekinetic power leads him on a life long journey to discover the secrets in the brain behind these powers. "Thirty-five years later, America is threatened by these same powers causing Gordon Whittier to find himself entangled in the middle of international espionage and surrounded by murder and intrigue. "Then Is The Power is an incredible read! The plot takes several spins through fast paced action and drama. It poses the questions of was this the unknown power of the Incas and other past civilizations like them? And, if we had these immense powers now, would mankind self destruct? Gerald Mills takes us on a trip where we can see and get a feel for the strains and mechanisms of government. I truly enjoyed it, look for this one! Reviewed by Joy Spear for Murder and Mayhem Bookclub. "A thriller with an international flavor, where the innocent are hunted, the knowledgeable hurt, and the guilty are extraordinarily powerful. "The author's style is appealing, and Mr. Mills' command of the language and technique are outstanding, which allows the reader to glide through the story without a hitch. But beware, the cast of characters is broad, the settings are numerous, and the pace suits the events. "The ending is both satisfying and yet left a bit open, which makes me suspect Mr. Mills may have another work coming on the heels of Then Is The Power. As a reader, I can only hope so. Reviewed by E. L. Noel, award winning author of The Threshing Floor.